I’ve received a lot of emails asking about shadow people. The questions surprised me. I don’t watch many ghost-related TV shows, so I hadn’t realized that “shadow people” were trending. Also, shadowy figures used to be so rare, I’d never given them a label. They were just a fleeting dark something-or-other, sometimes seen out of the corner of my eye. Frankly, we see a lot of weird things at haunted places. A brief, moving shadow or two…? Not so unusual. 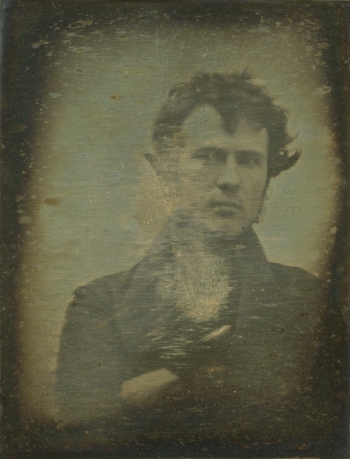 The first time I heard the phrase “shadow people,” I think Grant Wilson used it. Oh, I knew what he was talking about, but — at that point — I had no idea that lots of people were seeing them. Since then, it seems as if many more people are seeing shadowy figures. Is it because they’re looking for them? Or, maybe some entities aren’t as reticent as they used to be. Over the past couple of years, I’ve seen many shadow people in TV show footage. I’ve also taken photos of one, in a weirdly haunted private residence in Laconia, NH. The best picture is shown at right. In real life, his shadow looked like a normal person’s shadow… except that the hat shape looked like something from the Colonial era, or very early 19th century. The figure moved like an everyday person. It didn’t float. It didn’t fade in and out. It looked like someone was walking on the other side of the basement, in front of a light source. And then it walked away, moving towards the wall at the far end of the basement, and the figure vanished. Since many people in New England take part in Colonial and Revolutionary War re-enactments, I fully expected to see someone – in costume – when I rushed ahead to see who’d caused the shadow. No one was there, and we’d have heard footsteps, running, if someone had dashed upstairs. Had it been a prank, the basement was too large for anything but the hastiest getaway. We checked everything to see if a normal shadow could explain it. The basement wasn’t very cluttered, so no one could have been hiding from us. Only one other person was in the house during the investigation, and we’d have heard his footsteps. Plus that, his build differed completely from the shadow. We found nothing to explain this figure. At least two of us saw it, in addition to my photos. A couple of years ago, I turned on a ghost-related TV show. On it, I heard the star declare that shadow people are killers. She insisted they’re extremely dangerous. If a shadow person has ever killed someone, I haven’t heard about it. Likewise, shadow people don’t have features. It might feel as if they’re looking at you. Being certain of that…? Nearly impossible. It’s just the outline of a body. You can’t see its face. I have seen the Ghost Hunters’ episode where a shadow person seemed to peek out from behind something. We can assume the shadow was looking toward the investigators, but we can’t be certain of that. Shadow people look like shadows. While you can find a lot of speculation about what they are (and aren’t), we really don’t know. Here’s another researcher’s opinions about shadow people. It’s an eight-minute video. They might be ghosts that manifest as shadows. Maybe they’re not able to create EMF spikes or generate EVP, and they can’t rap on tables, but they can create shadows. That’s one guess, anyway. I doubt that anyone knows with certainty. Or, shadow people may be something entirely different than ghosts. At this point, anything is possible. Shadow people may be fearful apparitions, trying to hide from us. Shadow people might be minions of demonic entities. Then again, shadow people might be aliens in a form we didn’t expect. From reports I’ve read, I suspect that shadowy figures are a description, not a category of entity. Dark portal to the night sky? One of the most mysterious shadows I’ve seen… well, it wasn’t a person at all. But, it was very odd and I’ve never heard a reasonable explanation for it. Around 2009, my husband and I were driving from New Hampshire to Dragon Con, where I was a guest speaker. It was nighttime. The sky was dark and a little cloudy. Driving south on I-95, we saw an odd column of darkness on the left side of the road. It looked like it was in back of a stand of trees, and about 100 yards from the shoulder of the highway. It was similar to the kinds of columns created by searchlights, but column was darker than the sky, not lighter. In that rural area, there were no spotlights or searchlights to create an illusion with contrast. I thought it was fascinating and I wondered how they’d created that effect. It was a great alternative to a spotlight. Since then, we’ve never seen it or anything like it. 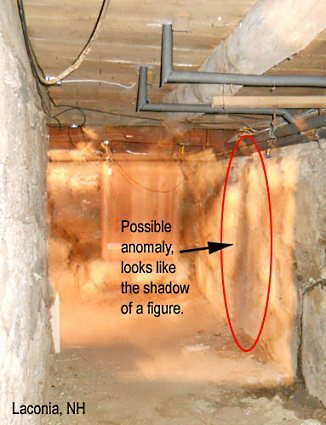 With the increasing reports of shadow people, was that column a conduit for them? I haven’t a clue and it may have nothing to do with shadow people. It’s just an idle thought to consider. In terms of shadow people being evil, malicious, or demonic, I’m skeptical. The shadow person I photographed (the interior photo, above) was about 30 or 40 feet from me, and I sensed nothing at all from him. He was just there. His form didn’t seem to be sucking up light, like some sort of energy vampire. He wasn’t menacing or cowering or sending evil death-ray energy at me. He was just a shadow. Until we know more about shadow people, keep your distance. That’s just a precaution. So far, I haven’t seen or heard credible reports to suggest they’re dangerous. Whatever they are, I don’t think they’re ghosts, but I may be wrong. It’s fine to make note of them. Other than that, I’d keep the study of shadow people distinct from ghost investigations. If you are worried about a shadow person – or any paranormal entity – harming you, this is the most thorough protection guide I’ve read: The Ghost Hunter’s Survival Guide: Protection Techniques for Encounters with the Paranormal, by Michelle Belanger. 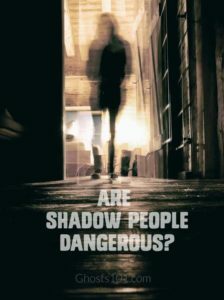 Note: As of mid-March 2019, I’m not approving comments asking what shadow people are, or if I think they’re dangerous. This article contains all the information I have. Claudia, that’s a good question. I’m actively studying shadow people right now (late 2017). From what I’ve seen, we can communicate to shadow people. They seem to flee if we get too close. So, they’re aware of us and respond to what we do. That means, at the very least, they’re sentient or controlled by something that’s aware of us and responsive. Personally, I think they’re individually aware of us, and not under another entity’s control… but I’m just guessing. Whether we can get them to respond to us — except to bolt away from us — is an issue I’m less certain about. I will publish my study results when I have enough to say. Right now, I’m at the point of being sure of a few things, but baffled by others. I’ve been talking to shadow people ever since 2014. I have two specific ones that are good friends of mine and that’s been living with me ever since I first talked to them. I gave them official names: Blue and Care Monitor. Blue waved goodbye as he went back into the hallway to my bedroom and disappeared into the dark abyss. My mom came back in time, wondering if I was okay. I told her I was perfectly fine. I met the Care Monitor at school during a shooting drill everyone had to do as class effort. When the drill began, my math teacher turned off the lights and told us to turn our desks to the front door, have the desks fall forward, and hide behind it. And so we did. I was extremely annoyed at all my classmates since they weren’t taking it seriously. I turned around to the back board, which was right in front of me, so I didn’t face them. On the left side of the board was a door that lead into an empty classroom that used to be a choir room. In the room was a lit up lamp, which was right next to the Care Monitor. I told him I was okay. The Care Monitor hugged me, and I hugged him back. After it, he told me in whispers to look at the door. I faced my body towards the door and I noticed everything faded to pitch black. I realized he was covering my eyes, pretending it’s not a drill and so I wasn’t looking at any “blood, guts, gore, and more” if the “shooter” enters into the classroom. I was sensitive to any medical and murderous scenarios, anyway. About a week ago, I accidentally got hurt while doing some acting for a play in my room. I looked through my doorway, and entering my room was the Care Monitor. How did I know it was him? As he entered in, he did the same surprised stance as he did in the choir classroom by the lamp. He went on his knees to see what was wrong, and it appeared to be a carpet rash on my knee. I told him to not worry and that I knew what to do, but he still tried looking for something to heal me. He looked at my lotion on my dresser and tried picking it up, but he couldn’t since he was made out of shadows. I told him I could get it, which I did. While I was rubbing the lotion on the rash, he watched me the whole time, standing by my lamp (hint hint), until I was done and the lotion was completely rubbed in. The Care Monitor waved me goodbye, and as the lights flickered he vanished from sight. I still see Blue and the Care Monitor here and there, walking through the halls or talking to each other by my piano. Some nights, I see one of them or both waiting for me to fall asleep completely. They must know I’m a light sleeper. I still talk to them when I want to or when they want to. I tell them how my day went, and they’ll always listen to every story I share to them. I never had any bad experiences with them or any other paranormal activity I run into. As long as I treat the afterlife like my friends or family, they’ll always respond back to me with a thank you and never betray me unlike how others treat or rumor about them. Kill them with kindness. That’s what I’ve been doing. Why not everyone do the same? my nine year old has told me since the start of the summer he keep seeing a shadow figure that is the same size as his little sister. well tonight i saw the large head short shadow figure dart into my bedroom closet from the hall I jumped up and flash my flashlight cause i thought it was my son playing my daughter was laying next to me sleep. my son was downstairs laying on the couch. I got an alien vibe from the shadow figure and it is female you just know. could shadow people possibly be normal people in a different earth in another universe accidentally somewhat showing up to us? Could the reason we cant communicate with them is because they see us as shadow people and they are afraid? GS, I think that’s a great question, and something worth considering. I don’t have any reliable answers to those questions, but I’ve often suspected that some ghosts – not just shadow people – are alive & well in their own reality/time/universe, and – for some reason we don’t know – they appear here. And we may appear there, as well. One night I woke up and turn over. Right at that moment I saw large shadow which to me seemed like a man wearing a hat. Like a fadora hat. He had no face it was just dark. He came to the side of my bed and began to lean over like face to face with me. I swattend him away with both hands as you would if a fly or bug was in your face. He then disappeared. I wasn’t frighten at all and fell back asleep. The next day I remembered and was confused about it. My father died 2 days later from a heart attack. Now this was my father’s second heart attack in 10 years. I don’t know what it wanted. Hi there! I have seen shadow people at home in Mexico city where I live and I have spoken with some of them but in my brain not with words. Some of them are around me when I am in bed sleeping at night! I must say I have seen they also have some bright lights around their shadows. Last night my dog woke @ 1:50am & left the bed barking. My husband works nights so I got up to investigate. Nothing. Between 1:50am & 5:00am I woke 3 times with the feeling someone/thing was standing in the bedroom doorway. What was very strange is that I know it was 3 different someone’s. When I woke each time I had the feeling of just seeing a paper with their name & info on. But I can’t remember any of it. I am a witch & I’m familiar with energy & entities. These visits actually scared me which is unusual. Our family always has sentinels & shadow figures in & around the house. My husband & boys have seen them inside & outside the home for years. We’ve also had small “creatures” darting around the house. None have ever caused any harm. Every house has had someone who stands guard in our hallway, outside the bedrooms. This was different & the 1st time I was ever scared. That does sound scary. In your situation, I’d put a bowl of salt in your bedroom, and every room you want to protect. Many readers report good results from that. But, at the very least, it should buy you some time to gather more information about the figures. Maybe the paper & names will become more visible/memorable in the near future. I’m wondering if your house site has a history that might explain why this is happening now… an anniversary of a past, local event, or something. I’d also look at natural and man-made changes within, say, 1/4 mile of your home. An increase in water, like underground streams, or a new road, bridge, or highway. I mean, the question is: why is this happening now? Why not before? Historically, salt is good protection from this sort of thing, but it probably won’t hurt to use some additional protections — whatever fits your spirituality/practices — as well. Let me know what happens. I’m very interested in this, and where it’s happening. Your IP suggests Lebanon. Is that right? Is there any chance energy could have been churned up by the 7.2 earthquake near Iran & Iraq? I know it’s a considerable distance, and I’m not seeing any significant measurements in Lebanon reports, but… well, people reported tremors in Jordan. If that’s the cause, this may have been a one-time incident. Sarah, whether or not the salt works, protection is a good idea in any spiritual context; it doesn’t have to be witchcraft. I have recently encountered a shadow person just hours ago. There seems to be a strange phenomenon with angel numbers and these shadow beings, at least from experience. Hope I don’t offend anyone. I see orbs, flashes of colored lights on a regular basis and have even once seen , a cold, robotic, angelic-huminoid apparition. I began to question my sanity with these clock numbers, orbs, and De ja vu . Now my partner starting experiencing the same things. Since I started learning about these “angel numbers”, it only got worse and there is nothing angelic about these numbers as my feelings and internal knowing says otherwise. I would feel a vibrating and buzzing sensation when an angel number on the clock would occur, that is when nudging, sometimes physical sensations provokes me to look at the clock. The number that i saw when the apparition appeared was 3:22 am. During that time i was catching up on some work and i began to have negative memories from the past that began to flood my mind, for no reason. It was in that moment I have seen the apparition from the corner of my eyes. My adrenaline kicked in and i was willing to fight the apparition that was still in my sight standing 10 feet away. When i turned to call out to it in rage, he was observing me and almost inducing these feelings in me. It was as if he was trying to wait for an opportunistic moment, as I can recall the feeling of heaviness, which and also felt like a vacuum, followed by ringing of the ears . After i yelled at the 6′ 2” tall, skinny-shadow person , no hat, he took off running as i rebuked him in Jesus name. Calling out in Jesus name seems to help quite a bit, but don’t understand why they continue to return every month. There are times i have sleep paralysis , followed by an unwanted, spontaneous out-of-body experiences and when im really tired. The previous night, my significant other complained about having nightmares of being watched and couldn’t see who was pulling the covers off. When i walked in, I could hear my partner crying in agony in sleep, however no covers were pulled. When i looked at the clock it said 4:44 am . I must also note that i seen the apparition of a shadow cat in my house prior to the shadow people. Relieved to know I’m not alone, but very sorry you are all also experiencing this. I have tried salt water,cleansing with sage, palo santo , bells, prayers, etc…. although shadow beings leave for a while they still return, can’t let my guard down for one second until others take his place. Even have done internal reflection via forgiveness, removing energetic ties to people of the past, lots healing of my own shadows. Lastly, I also wanted to mention that my twin bother and I have seen the hat man, shadow person with a hat and red eyes who intentionally tried to scare us. Is there any connection between dark beings masquerading as angels? Are shadow people connected to the hat man? Thanks in advance. Albie, the number of things you’re reporting – as well as their frequent returns – concern me. I’m glad that calling out Jesus’ name seems to help, as that suggests the entities aren’t demonic. However, I urge you to speak, in person, with someone who works in a mainstream, spiritual field, as soon as you can. It doesn’t matter if you go to that church or even believe in what they teach. The fact is, anything shadowy with red eyes* is not a typical ghost. It’s something else, and – technically speaking – it’s a spirit, therefore I think you should start with someone well-versed in spiritual matters. The interrupted sleep is also a concern. For that, as well as the sleep paralysis and the out-of-body experiences, you may want to talk with a doctor. That’s not about the cause of it, but about making sure you’re getting sufficient deep sleep. You’re more vulnerable when you’re tired, and if your sleep is being interrupted, that can be a Catch-22 issue: The interrupted sleep makes you more vulnerable to what’s interrupting your sleep. It’s important to address both sides of this issue, immediately. Advice (and “experts”) online can’t help you nearly as well (or as quickly) as someone you talk with in real life. *When I talk about shadowy figures with red eyes, I’m usually describing urban legends, and they’re generally related to haunted cemeteries. I’m never sure if those figures are real, or if the stories come from people who were influenced by stories they’d heard earlier. Either way, those are usually one-off encounters. When something like that shows up in real life, in your home or personal space, it’s a very different matter. Take this very seriously and talk with a minister or priest about the spiritual possibilities (and solutions). Regarding shadow people and Hat Man, I’m not sure. I think they’re related but – at this point – I haven’t seen Hat Man often enough to speak with authority on this topic. Basically, we’re trying to use labels to categorize paranormal phenomena, and it’s all guesswork at this point. We can look for patterns and connections in these things, but it’s important to keep an open mind. I think I saw a shadow person out of the corner of my eye while I was watching anime 1-2 hours ago. It looked like it was just coming around the corner. My head snapped towards it immediately to look at it and as soon as I did, it was just gone without a trace, and it was completely silent, unlike other people report on here, saying they heard wispers coming from it. So, not thinking anything of it and assuming it was my imagination, I just return to my anime. I havent seen the thing since. It was likely my imagination, but I’m posting this just on the off chance it wasn’t. So when I was 7 I had this nightmare, in the last part before I woke up there was nothing like it was all black and then I turned around and saw a grim reaper. My nightmare later predicted my late uncles death in 2016 and I just found out in 2018. So that got me thinking what if the shadow people are the people who died and are stuck on the other side and are trying to communicate with us, for example like they’re trying to get help or just wants to kill you. The shadow person I see is a man and sometimes I think it’s my late uncle but I know it’s not possible, I’m only 13. Autumn, that’s an interesting theory. Many people – who, as adults, get involved in ghost hunting – have stories similar to yours. That is, they’re sure they’ve encountered the spirit of a recently deceased relative. It can be very reassuring to find evidence supporting what they thought they experienced. Recently some wired stuff has been happening in my house. It eventually lead to a scary voice saying help me to my naked ear…. For a while I had been scared since.. He was tall .. had sharp facial features.. like a perfect sideways cutout of a silhouette.. I could tell he had a hat on … And he walked with a stride only slightly faster then mine..
Here’s the kicker… He was walking in a hall way with all the lights above him and behind him on…. But he was walking in the light.. This on-top of some really scary things has me on edge..
Was he trying to scare me? Or tell me he was there to protect me? Rachel, if you keep seeing him, keep a diary. Note every time you see him, and all the details… day, time, cycle of the moon, how you felt before/during/after, and so on. You’re looking for patterns in when he appears. There’s no way I can tell you if he’s there to scare you or protect you. Also, the “help me” could be something completely different, but coincidental during his appearance. The “help me” could be residual energy from one time; he could be an active spirit, or a residual energy image from a different time. There are lots of variables. It’s important to keep notes, to see what each event has in common. So just a little background – I was born into the “Santeria” religion and although I do not practice it as an adult I’ve always been around the presence of shadow people, spirits and other entities I cannot fully explain. About 3-4 days ago I summoned Clauneck (Demon of Wealth) and after sometime of meditation by candle light I noticed a shadow to the left of me. At first I thought it was the reflection of my towel as I was in the bathroom, but I tried to recreate the shadow using and I couldn’t. I remembered the shadows outline perfectly and even drew it. It did not speak to me and I did not want to frighten it, so I dared not to take a photo of it. I didnt feel a negative energy coming from it, but I did feel a little uneasy because of the shape of the shadow. It wasn’t as human-like as others described seeing, it looked like a person or thing sitting down. The shape was something similar to how headstones are portrayed in cartoons. I tried recreating the shape many times using the same conditions and nothing. Just wanted to see if anyone else has seen / encountered this type of shadow figure. My son, who is 10 now, has been seeing shadow people for quite sometime. At first they scared him, but now he says he just ignores them. He says that they go as fast as he sees them. I told him he should talk to them but he says they’re super fast. Any advice? Megan, I wouldn’t encourage him to interact with them. That could open another door of access to him, and – if the entities are angry or malicious – put him at risk. In addition, his first reaction was to be frightened of them. I’m a firm believer in respecting your initial impression – your “gut feelings” – about paranormal entities. I don’t want to alarm you. I just avoid communicating with spirits that are outside the mainstream of ghosts we usually deal with. And, I especially discourage children from communicating with them, unless an adult is present and that adult is experienced in paranormal research that includes darker entities. Ok so I have seen a shadow person in my house many times and a couple nights ago I was laying in bed and all the sudden next to my bedroom door a shadow person apeared it was a full body just standing there and it got closer to me untill iy was right beside me. But the weird thing is I had no fear of it. I was just there I guess. I was unable to move during this I think but I didnt really try either because I felt like I shouldn’t. After it got super close to me I ended up blacking out and just woke up in the morning trying to make sense of wtf just happened. Quinn, I think you’re being very level-headed about this. I’m assuming you’ve ruled out “night terrors” as a possible cause, since they also include a sense of paralysis. But, either way, if you felt like you shouldn’t move, it was smart to follow your gut feeling. We don’t fully understand shadow people yet. They’re so fleeting, and so unpredictable, it’s difficult to study them. A couple of weeks ago -when i was kind of sick- i kept waking up in the middle of the the night multiple times. I didn’t think much about it, but then i started to try and understand why i woke up. So the same happened, i woke up at something like 3:24 or 3:34, i cant quite remember and felt the presence of something. I sort of heard whispers, but then instantly fell asleep again. It happened multiple times that week. Aron, your English is fine, and I’m sorry that you’re being woken by something so troubling. If I were you, I’d start by putting a bowl of salt underneath your bed. (Half a cup is enough.) That’s the simplest “cure” for what you’re experiencing. If the whispers continue, the next thing I’d do is vacuum everything: the floor, the corners of the room (especially up near the ceiling). I’d also put a second small bowl of salt next to the bed. The footsteps are odd. It could be simple residual energy. If it continues and it’s troubling, there are two things you could try: One is to put a bit of salt in your pocket. I have no idea why salt repels spirits, but it seems to. The other thing I’d try – because I’m interested in this kind of thing – is putting my phone (or any recording device) in “record” mode, to see if you hear anything in the recording. That would include the sound of the footsteps, and possibly anything said by whatever-it-is. If you hear the footsteps (in real life) but they’re not in the recording, that increases the likelihood that what you’re hearing is internal to you – that is, psychic. And that increases the likelihood that it’s residual energy. Okay so I work at a home for the elderly, and have never felt unsafe or as if I wasn’t alone. I’m very sensitive to that feeling and trust my gut; however, I have been seeing figures in the daylight, where the sun can shine on them and everything. I know it’s the same one. It’s gotten more cisable over time. It used to just be a shadow but I had arms now and I see it much more often. I usually ignore it but after I saw it had arms and had appeared three times during my shift, I’m getting worried. I’m scared it will follow me cause it seems to be showing an interest, since it comes back so often. It’s always in the corner of my eye but once I walked by and didn’t realize it was there until I ran back. I almost looked at it head on, and it stayed until it couldn’t see ME anymore. So I’m a bit concerned. Not once have I felt freaked out and yet I am scared I’ll get in my car and be too scared to look behind me cause it’ll be there. I honeslty think it might. I’ve gotten chills getting in my car and so I double check, then nothing and I’m calm again. Lavon, is it possible that it’s someone from your past, rather than anything sinister? Generally, ghosts – entities that won’t “cross over” – don’t change locations. That is, they stay at one site. So, I’m not sure you need to worry about the shadow person following you. But, we don’t really know what shadow people are, so I’m not sure I can make generalities about them. I’m not certain they’re in the same category as ghosts. Spirits of friends and family members – people who have moved on, but check in to see how you’re doing, now & then – are another explanation. It might even be someone who once lived in the home where you work. What interests me most are the arms. That’s unusual unless a torso is already visible. Physiological studies show that the torso stores the most energy, so – if my guess is right – that’s what’s usually most visible when someone sees an apparition. Arms, but no torso…? I don’t think I’ve ever heard of this, before. It’s definitely odd. As I’ve recommended to others, you may want to carry a bit of salt in a pocket. Salt seems to repel many entities, as well as negative residual energy; it’s why they used to “sow the ground with salt.” (I’ve used salt a few times when some entity seemed really annoyed with me, and a bit obsessive.) In your situation, I’d recommend about 1/4 cup in a ziplock plastic bag or something. Just put it in a pocket and forget about it. That may be enough to make whatever-it-is leave you alone. On shadow people being dangerous im skeptical as well because ive had an experience with one where i saw her out the corner of my eye rush into the closet (I didn’t think much of because I usually saw that as a little kid) then i saw her in a dream (she seemed pretty friendly) and then a few night after the dream i saw her again sitting on the edge of my bed (i was still able to move so it wasn’t sleep paralysis i had to roll over to see her) and she reached out for me but before she can touch me she vanished. Since then i haven’t had any more experiences with her but i still get an odd vibe sometimes when im home alone. What are your thoughts on this experience? Jacob, we don’t know what shadow people are. Until we have a better idea of what they align with – benevolent spirits or malicious ones – if that even fits with what they are, I’m cautious to say much more about them. Hi I’ve have seen a dark shadowy mass in my living room. It appeared on the floor, just a mass and there long enough for me to think hmmm seem it and I’m not paying attention. Also more at night movement but shadowy. No I’ll feeling but a lil on edge at the fact I see this every now and then. Haven’t had the hat man red eyes or bad feeling, thank you God! I do feel protected. But all the same slightly unnerving. Aysha, as long as you aren’t feeling uneasy about the shadowy mass you’ve seen recently, I doubt that you’re in any danger. Despite that, it may be wise to speak with a minister about this. Find someone local, and be sure you’re comfortable with him or her. Explain everything to the minister, and see what he or she recommends. This isn’t something anyone can evaluate, online, and – from my experience – local ministers, priests, etc. are usually the best people to answer your questions. It was around somewhere 8 or 9 pm that I saw this black shadow it looks really tall as tall as the door frame or somewhere around there and I saw the shadow slowly pass by my door I got really scared I felt a really anxious and paranoid feeling when I saw it and then I told my friends that I was scared and then I heard a voice/whisper say “Don’t be scared” and that really did scare me and I’m not sure what that is or if the person is safe? Ethan, it sounds like you encountered two entities. One was the shadow person. The other was a spirit protecting you, and let you know you shouldn’t be scared. However, some spirits can cleverly deceive people. So, I’m not sure I’d trust any entity I couldn’t see and feel comfortable with… but I wouldn’t worry about this, either. My best advice is to wait & see if anything else happens, that sheds light (no pun intended) on what’s going on. Okay so this might sound weird but me as a 17 year old I saw a shadow person or shadow demon. It was the middle of the night and I suddenly wake up to the sound of footsteps in my own house. When realizing that it was probably my mother or father walking down the hall to go downstairs but No it wasn’t at all all I see in the middle of my doorway was( guessing) a 6’1″ shadow person/ demon. I quickly grab a nerf gun but the minute I turn, it was gone? That was a brilliant reaction. I wish the figure had remained there long enough for you to see if the Nerf gun made an impact, went right through the figure, or what. probably, but they seem real to me. cupboard open themselves and a shadowy figure walked by starred at me and disappeared while on the computer this was always before I had to go to court, I had many hearings, then it stops, well the odd bulbs blown, but I am used to all by now that electrical things break bulbs and…etc. Ella, I’m so sorry to read that you’re dealing with this. Some of this sounds like classic poltergeist activity. Other things could be more dangerous, but start by treating this as poltergeist activity. First, do your best to forget about the woman who asked you to teach her witchcraft. She didn’t cause what’s going on. What you’re describing is very different from a curse or anything like that. Her call and these problems starting… they’re probably a coincidence. Next, go to your church and have a heart-to-heart talk with your priest or minister. Make it clear that blessing your home made things worse. That’s important. Mostly, it’s important for you to remain calm, and talk with a counselor – like a minister – about your life in general. I believe that poltergeists are more likely to torment people whose lives are in turmoil. A minister can refer you to people who can help, whether it’s with work or your personal life. It’s important to stabilize your life as much as you can. The Internet is not the place to find the answers you seek. What you’re describing is far outside my expertise, but I’m confident that your priest or minister can refer you to someone (or several helpers) with the skills and experience you need to resolve this. I hope things work out for you, soon. I came home from work mid afternoon and was the first person home. I opened the back door to let the dogs in. They excitedly ran half way up the back steps then stopped and turned around looking at something. I attempted to follow what their eyes were tracking as the both let out the weirdest growl I have ever heard them make. At first I could t see what they were looking at but then I saw this shadowy distortion vaguely humanoid in shape. At that point it stopped moving across the yard and began rushing towards me. It filled me with fear and dread. I was acutely aware this thing was pure evil. I then became aware of something in the house behind me. Before I could react that something passed through my body, down the stairs and chased the shadow being away. Having the entity pass through me drained every ounce of energy from me and feeling was like I had been covered head to toe in cold honey, my muscles were frozen with feeling gradually returning after almost a minute. I never want to experience a shadow being again. Stuart, that sounds like a very unsettling experience. Not just the shadow being, but whatever passed through you… which may have been something else altogether. At this point, it’s not clear which – if either entity – was the “good guy” in that confrontation. I think you were the innocent bystander caught in the middle. I’d say that most benign entities don’t do anything that might harm a living/human person, but maybe whatever passed through you didn’t have time to be polite about it. This certainly adds to the mystery of what shadow people are, and the realm they’re in… assuming their world overlapped ours, briefly, and they didn’t deliberately enter our plane of existence. Thanks for posting that comment. It’s definitely something to think about. I have yet to find any convincing evidence that shadow people are actually dangerous. Especially since you have a history of being around them, I don’t think you should worry about the one who was so eager to get your attention. Previous Previous post: Are there grants for paranormal research or ghost hunting? Next Next post: What’s the difference between a ghost hunter and a parapsychologist?